It's hard to believe the Superbowl is next weekend. Wait, no. My roommates have been sending me recipe ideas for the last month to make sure we have a good spread for literally just the four of us. I'm currently signed up to make some sort of cheesy buffalo pull-apart bread, a giant cheeseburger concoction, and someone's mom's cheese dip. You can tell we're in Wisconsin because our fridge is like 90% cheese right now, and the rest is beer. While I'm not sure much will compare to last year's cheesy buffalo pretzel ring, I tried to think beyond the cheese for this recipe for more of a balanced diet. It combines a Wisconsin favorite--beer brats--with some Southern flair--biscuits and gravy. 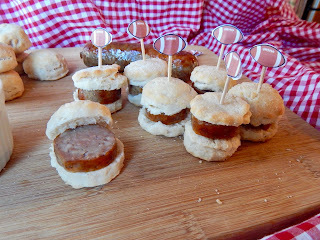 These bite-sized biscuit sliders are stuffed with savory beer-braised bratwurst and dunked in boozy beer gravy and are sure to be the star of your Superbowl party. 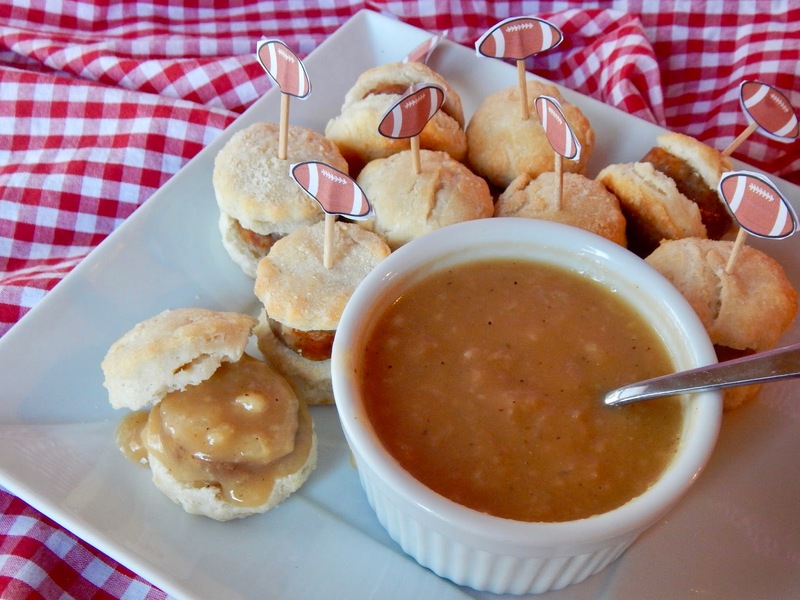 It all starts with my favorite biscuit recipe. Yes, biscuits come in a can. Yes, I have spent countless hours in class learning about them thanks to one of my professors who used to work at Pillsbury. No, they're not as good as homemade. I guarantee my homemade biscuits taste better, have more layers, and can be made into cute little bite-sized rounds for perfect little sliders. The secrets? Make sure everything is cold, handle the dough as little as possible, and always use buttermilk. You can read more about it in the original blog post, but follow those guidelines and you'll have great biscuits every time. The next component is the bratwurst. 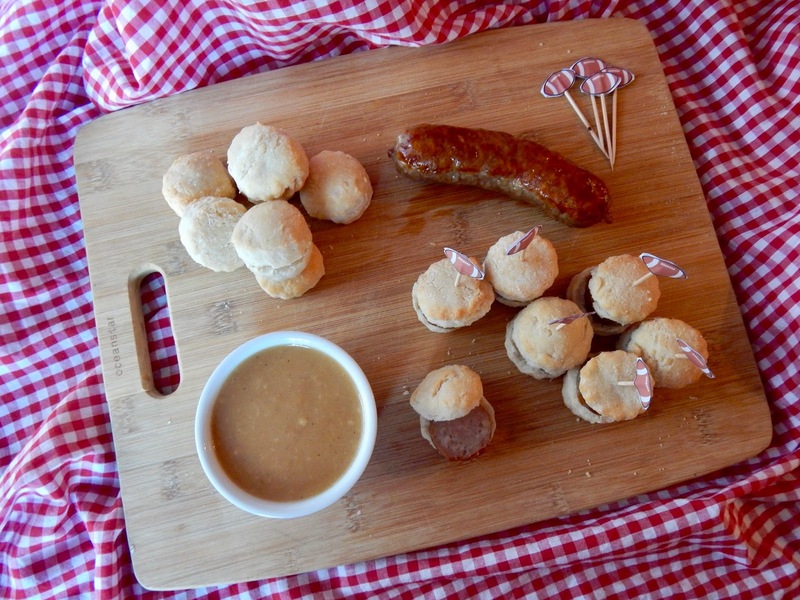 I won't get all fancy on you with a recipe for bratwurst from scratch. I'm just a candy scientist, people. I just take a package of (good quality) bratwurst from the grocery store and cook it in beer like any good Wisconsinite. Simmering the sausage in the beer infuses the sausage with the beer flavor and the beer with the sausage flavor. It's win-win. Of course, I do sear the bratwurst afterwards since nothing compares to those tasty browning reactions. 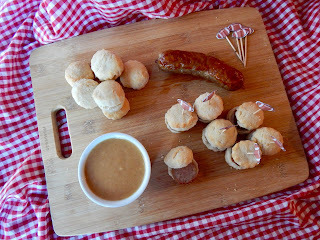 Once the sausage rests for a few minutes so the juices don't spill out everywhere, I cut them into coins, which should be about the size of your lil' baby biscuits from earlier. The last step is the gravy. The trick here is to use the drippings from searing the sausage to make the roux and the beer from the sausage to turn it into gravy. It may take some experimenting with different beers; I found that some of mine became very bitter, particularly the hoppier beers I tried. Use your fancy craft beers as a drink, not wasted as a gravy. Pick a cheap, pale, mild beer and you should be ok. Worst case scenario, you make a regular roux with just butter and flour and add fresh beer if it doesn't turn out right the first time. 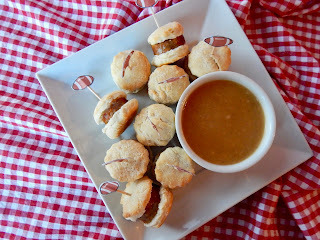 I would recommend serving these with the biscuits and sausage assembled and a big bowl of gravy for dipping on the side. If you have a small crockpot, this is a great time to break it out to keep the gravy nice and warm. If it gets too thick while the game drags on, throw in another splash of beer. I'd be willing to bet you'll have plenty on hand next weekend, and this is a perfectly good excuse to crack open a new one. I typically only watch the Super Bowl for the commercials and the Puppy Bowl, but recipes like this make it all worthwhile. Heat oven to 425F. Line a baking tray with parchment. In the bowl of a food processor, combine 3 1/4 cups flour, baking powder, and salt. Pulse in the butter until only small lumps remain. Add the buttermilk and pulse until just combined. Alternatively, combine the dry ingredients in a bowl. Cut in the butter with a pastry cutter or with your fingers, then stir in the buttermilk. Pat the dough out onto a floured surface until 1" thick. Fold into thirds like a letter for an envelope, pat into a 1" thick rectangle, and repeat, rolling to a final thickness of 3/4". Cut into 1-1.5" rounds and transfer to the prepared tray. Bake for 10 minutes or until golden, brushing with the melted butter halfway through. Meanwhile, heat the beer in a medium pot over medium-low heat until simmering. Add the bratwurst and cook for 8-10 minutes. Remove and pat dry, saving the beer. Heat some oil in a large skillet over medium-high heat. Add the bratwurst and cook on all sides until browned about 6 minutes. Remove from the pan, cool, and slice into coins. Drain all but 2 T fat from the pan. Add the 2 T butter and melt over medium heat. Add the remaining 1/4 cup flour and cook for 2 minutes until thickened, stirring constantly. 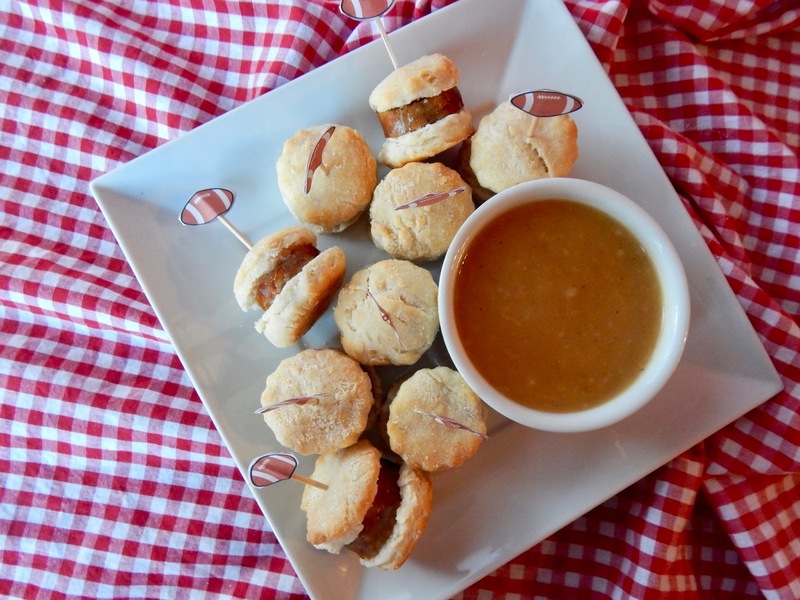 Slowly whisk in the warm beer from the bratwurst. Slowly whisk in the chicken broth. Bring to a simmer, season with the garlic powder, onion powder, and salt and pepper, and cook for 4 minutes or until thickened, stirring frequently. 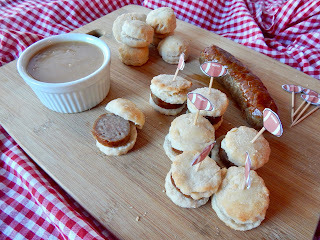 Slice the biscuits in half, add the bratwurst slices to form sliders, and serve with the gravy.